Thanks to a recommendation from my special someone, I got to see a worth watching film and is now writing this 3 Idiots movie review post. 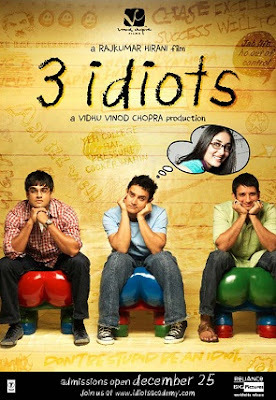 Obviously, the film I’ll review is the Bollywood film 3 Idiots. The movie was released in 2009 but I’ve only got to watch it earlier this year. I’ve been seeing friends over Facebook liking the movie’s page and my curiosity on what the fuss was all about was finally satisfied when my partner in life let me watch a copy of the film. 3 Idiots had been an all time blockbuster and was even the highest grossing Indian movie of all time since it was released. It’s no wonder why because of the adventure-filled plot from start to finish. But other than the creative storytelling element which Indian writers can be noteworthy for like in the novel turned movie Life of Pi and the Five Point Someone book by Chetan Bhagat from which this film’s idea had been originally derived from, the movie’s subtleties should be given more emphasis. Each subtlety is characterized by characters we can relate with somehow as they expose the reality of education not only in India but the world over. Here are some of them. Kareena Kapoor as Pia Sahasrabuddhe. Pia is trapped between choosing to keep family tradition by obeying her father for marriage or following her heart. His standards when it comes to choosing who to marry was based on credentials like career, pay scale, family background, and matters. The latter simply means the guy isn’t someone like Rancho (see name below) who kept on contradicting him. Pia’s standards are on love. R. Madhavan as Farhan Qureshi. Many have been forced to enroll in certain courses not of their liking because their parents wanted them to do so and that the profession is more profitable soon as they graduate. Farhan wanted to become a photographer but engineering is where the money is at in India. His parents will do anything to finance his schooling, even withstanding the heat of weather while he studies comfortably in an air conditioned room, the only one in the house with AC. Sharman Joshi as Raju Rastogi is his family’s only hope out of poverty. He can’t fail them, including his sister who can’t marry due to the lack of dowry but at the same time he can’t betray a friend even when forced to do so. He attempted suicide instead of passing on the blame to his friend Rancho by jumping off the school president’s window. Omi Vaidya as Chatur "Silencer" Ramalingam. You would study in a school which speaks a language you barely understand if it does offer the best curriculum right? That’s what Silencer did even if he was bullied and made fun off a lot during his stay in the school. His sweet revenge was a great career in the U.S. afterwards. Rahul Kumar as Manmohan "MM" aka Millimeter / Centimeter is a perfect example of what poor kids can accomplish when given the chance to attend school. In fact, it was only one memorable and inspiring encouragement from Rancho which made his life revolve on 360 degrees for the better. Ali Fazal as Joy Lobo is a wasted talent. He wasn’t able to complete an incomplete research because hopelessness forced him to commit suicide. Haven’t we heard of all too many school related failure suicide incidents? Boman Irani as Viru "Virus" Sahasrabuddhe is the perfectionist parent who wants the best for his child and not knowingly has driven them to suicide (not Joy Lobo but Pia’s older brother). His perfectionism is quite evident in the engineering college he presides. Aamir Khan as Ranchhoddas "Rancho" Shamaldas Chhanchad / Phunsukh Wangdu / Chhote challenges everything we know of when it comes to education. He eventually earned Virus’ coveted pen which he had received for being an exemplary student but had not passed on for 30 years. It was momentous because Virus had actually conceded to Rancho through that gesture. Rancho had always been known to break the rules due to his innovation and intelligence which often contradict the school’s norms and tradition. He was also in school not to be educated but to learn; thus, agreeing to use someone else’s name and take the place of a rich diplomat’s son just to be able to study while the real Rancho took the credit for the degree and for being number one in the class afterwards. What Rancho had learned helped him establish his own line of work as an inventor and teacher later on anyway even if his achievement in the premiere engineering school had been given up to someone else. His mantra, "Aal izz well..." is inspiring for many as well. For the movie’s plot/summary, cast/characters, and other important information, visit the 3 Idiots Wikipedia page. Check out this 3 Idiots YouTube page too for clips of the movie. Thanks for reading this 3 Idiots movie review and do send me a pingback to your own review.